The high electrical and thermal conductivity of copper is combined with the arc-resistant and non-welding properties of tungsten and molybdenum, or their carbides, to form an extensive series of compositions, each designed to give the best performance for your particular application. These materials are generally used as electrode materials for resistance welding and similar related applications and for heavy duty contact applications, relays, switches, etc. 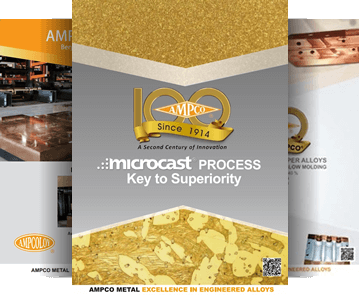 AMPCO® refractory alloys are manufactured by the powder metallurgy techniques of pressing, sintering and infiltrating with a very high degree of uniformity in the fine-grained microstructure of the finished material. Users enjoy an extremely high performance material which will stand up to the most severe applications and outlast other brands. 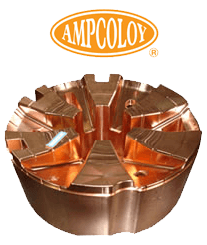 AMPCO® copper-tungsten alloys are of the highest quality available and the physical properties of our alloys significantly surpass the requirements of RWMA standards.